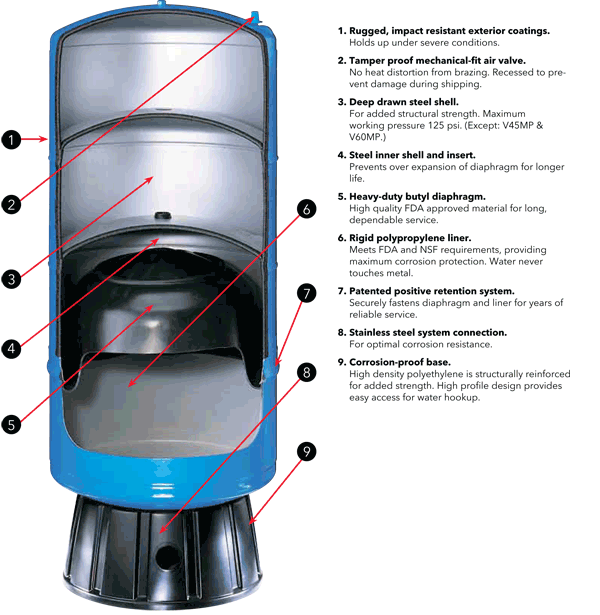 HydroPro tanks provide years of dependable water system storage and delivery service! The efficient design reduces pump on/off cycles, resulting in longer motor and switch life, and reduced power costs. Each tank is factory tested and 100% air and water tight. Deep Drawn Steel Shells: Provide maximum material strength. Inner Shell: Prevents diaphragm from over-expanding. Heavy Duty Diaphragm: Made of finest quality butyl rubber. Separates air and water, maintains air charge. Interior Tank Lining: Features a durable polypropylene liner. Meets FDA requirements. Stainless Steel System Connection: On all models. Appliance Appearance Exterior Finish: Blue color, high durability exterior finish of tough, powder coat over a zinc phosphate surface treatment. Tanks are designed for installation indoors or where they are protected from rain, irrigation over-spray, salt air and other corrosive environments. Always protect tanks from freezing. Heavy Duty Base: Made of high density polypropylene. Pre-charge: All tanks charged to 38 PSI.